Market Commentary: Normal Volatility or The Beginning of the End? How many of you are micro-managers? (You know who you are.) Don’t worry; I can sympathize as I fight my own helicopter tendencies. When things aren’t perfect my instinct is to swoop in and take over. I want to fix it thinking, if I throw enough willpower at a problem, it’ll turn around. Except, as all my micro-managing readers can appreciate, there are times when that can be the worst possible thing to do. For example, I remember thinking as a little kid that the plastic bags we got from the grocery store were too wrinkly. So naturally I tried to iron them. Guess what I learned? You can’t iron plastic bags! Do you know what else you can’t do? Have an investment account that always makes money. Unless you invest only in money market or straight up T-Bills, your accounts will move with the undulating waves of your holdings. We’re experiencing one of those waves right now. There was a crest at the end of September, and over the last three weeks we’ve experienced a sharp pullback. This has caused major indices to lose an average of 7% since the first of October. Economists use plenty of reasons to explain the volatility. The 10-year treasury rate spiked above 3%, new home sales are decreasing, trade tensions with China have no end in sight, etc. And while all of these things are happening so far, I think for both fundamental and technical reasons that this is looking like a normal pullback in the midst of a rising market. There are plenty of reasons to be positive on the fundamental front about the state of the U.S. economy. Tax reform is a significant tailwind and will become even greater next year. Corporate earnings are upbeat and sentiment is high, while consumer confidence is strong, and unemployment is low. 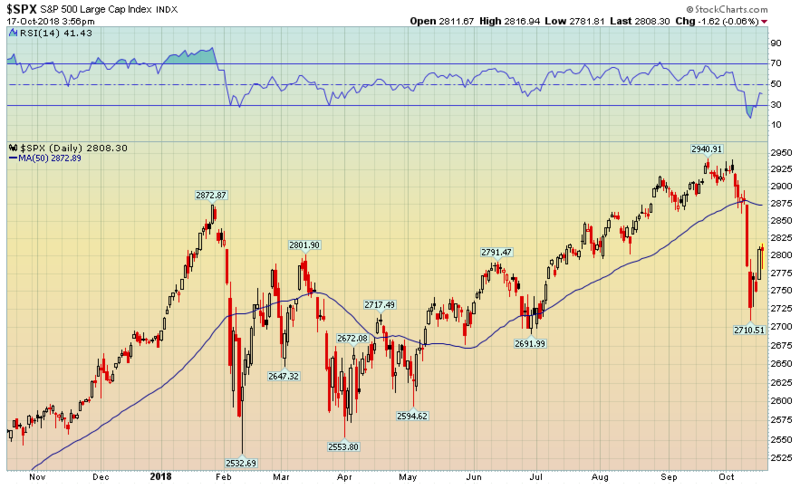 Looking at the technical reasons of the market, stocks are oversold. Pessimism has shot too far to the downside and we’re due for a bounce, but that doesn’t mean the volatility is over. What typically happens after a bounce is that we see a retest of the low, or a break below it, before stocks can make meaningful progress. The good news is that there may be buying opportunities ahead. More good news is that we’re heading into strong seasonality. November and December are typically positive months for the year, and can be even more so in a mid-term election year in which the first three quarters were positive. If you’re nervous, my first piece of advice is not to make emotional decisions about your portfolio or allocations. Talk with your advisor to see if your risk tolerance is in the right spot for you. Secondly, don’t look at your portfolio every day. This is known to be one of the leading causes of F.O.S. (”freaking out syndrome.”) No one likes to see his or her account in the red several days in a row. So unless you have a good reason to check your account values, step away from the computer for a few weeks. Go for a walk. Enjoy the fall weather. We’ll let you know if we see causes for concern. Securities offered through Cetera Advisor Networks LLC, member FINRA/SIPC. Investment Advisory Services offered through Cetera Advisor Networks LLC and McDaniel Knutson Financial Partners. Cetera is under separate ownership from any other named entity.